January magazines arrived a month ago, full of the annual list of ideas for organizing your house, life, office, even your car. I’ve been thinking lately about how we organize our workspaces. As Pottery Barn and Ikea entrance us with their coordinated sweater bins and modern snap-together wall-mounted organizers, how often do we ask this most important question: Do our workspaces support the way we work? A few years ago, Don Norman wrote an excellent article for ACM Interactions titled “Logic Versus Usage: The Case for Activity-Centered Design.” He discussed two different approaches to organization: taxonomy, in which items are ordered by category or name, and taskonomy, in which items are organized by the way they are used. Norman argued that while a taxonomic organization makes sense for libraries and grocery stores, it makes little sense for organizing workspaces. I don’t particularly like routines, which is funny because I’m an industrial engineer and classical IE involves designing routines for other people to follow. Over the years, I’ve tried to follow various organizational systems, but they tended to fall apart. A carefully alphabetized spice cabinet became a mess when I purchased new spices, because inserting one new spice required moving several others. Kitchen cabinets were organized according to pan size, but I frequently had to move three small casserole dishes to get the big one I wanted. Bank statements and receipts stacked up because filing was easy to put off. Reading about taskonomy help me identify the source of the problem: The organizational systems I had struggled to follow just didn’t match my use patterns. When I first purchased this house, I organized the pantry by the common taxonomic approach. Baking soda, salt, and baking powder were grouped together, as were all the vinegars—white, red, balsamic, cider, and herbal. I alphabetized the spices and placed those that would fit in the pantry doors. The others I grouped on a shelf, between the vinegars and the salt. But the shelves are deep and wide, and with nothing to keep items in their assigned places, stuff tended to migrate. Common white vinegar was as hard to retrieve as its gourmet cousins. Spices floated behind the syrup, peanut butter was never in the same place, and the salt always managed to slip into some dark corner. It was losing the salt—and the 60 seconds it took me each evening to find it—that finally motivated me to DO SOMETHING about the pantry. For my first attempt, I redesigned the shelves. I planned to replace the deep, flat plywood boards with a shallower but more closely spaced arrangement. The shelf heights would be changed so that frequently used items could be placed at or just below eye level. But without the time, skills, or tools needed for the carpentry project, the design ended up in the “someday” file and the salt kept disappearing. Reading about taskonomy showed me that I could achieve the same goals without changing the pantry’s structure at all. 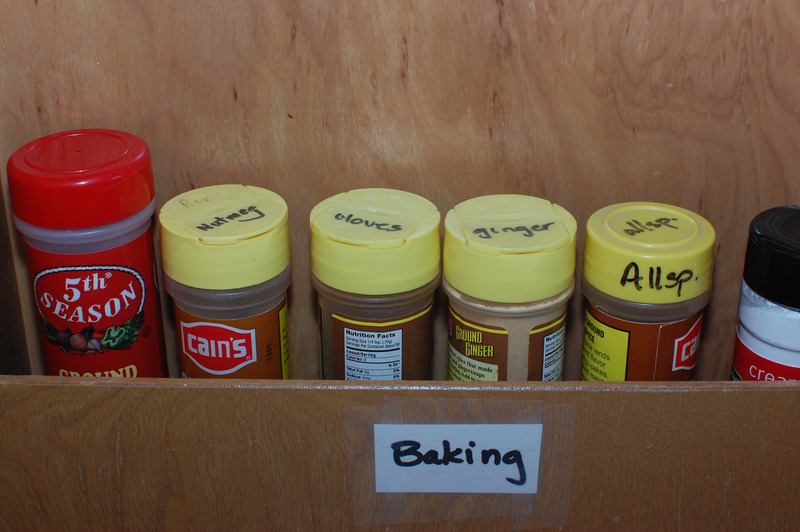 For the taskonomic redesign, I arranged the spices and other dry goods by use. I sorted the spices into four groups: Italian (including basil, oregano, and bay leaves), Baking (e.g., cinnamon and nutmeg), Specialty Salts (Nature’s Seasons, seasoning salt, garlic salt), and Savory (e.g., thyme and rosemary) and labeled the shelves in the pantry doors. I was not too rigid about the sorting–garlic powder, for example, is next to garlic salt–and the divisions are not particularly fine. 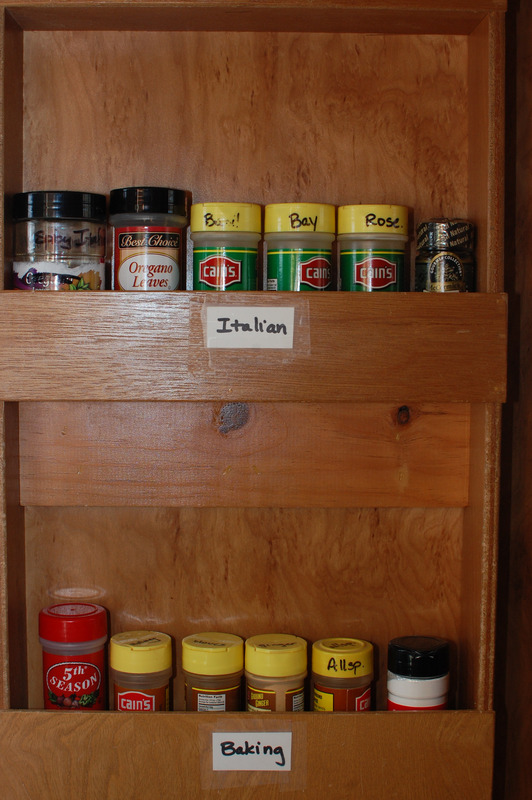 Because the door shelves hide the labels on the smaller spice jars, I also wrote names on the lids. Each shelf has enough space to add one or two more jars, and because I can see all the jars on one shelf at a glance, alphabetizing is no longer necessary. I used shallow baskets to sort other ingredients by use. The baking basket contains salt, pepper, baking soda, baking powder, and cinnamon-sugar. I often use several of these items in a single recipe, such as pancakes or cinnamon biscuits, so it makes sense to group them together. The basket also prevents the salt from migrating, saving me time and frustration each evening. In another basket (out of reach of my young children) I placed spicy blends and specialty peppers, such as cayenne. 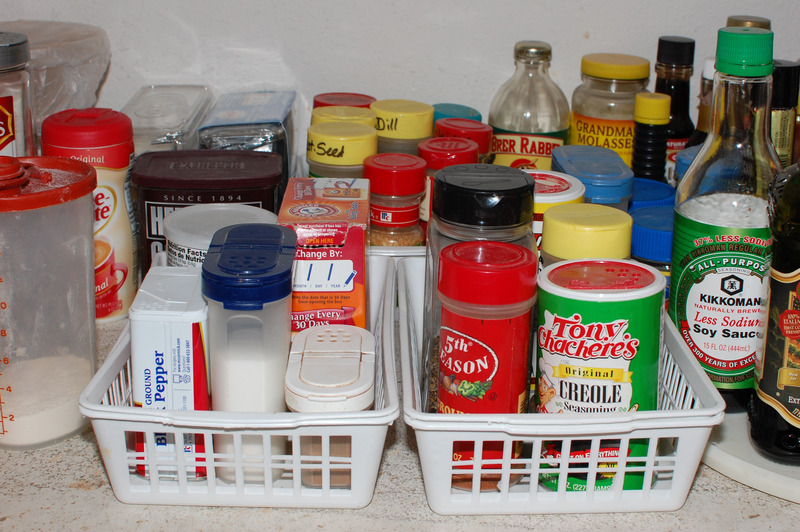 A third basket, placed toward the back of the shelf, holds rarely used seasonings, such as poppy seeds and dill. Bottled items were separated by frequency of use. 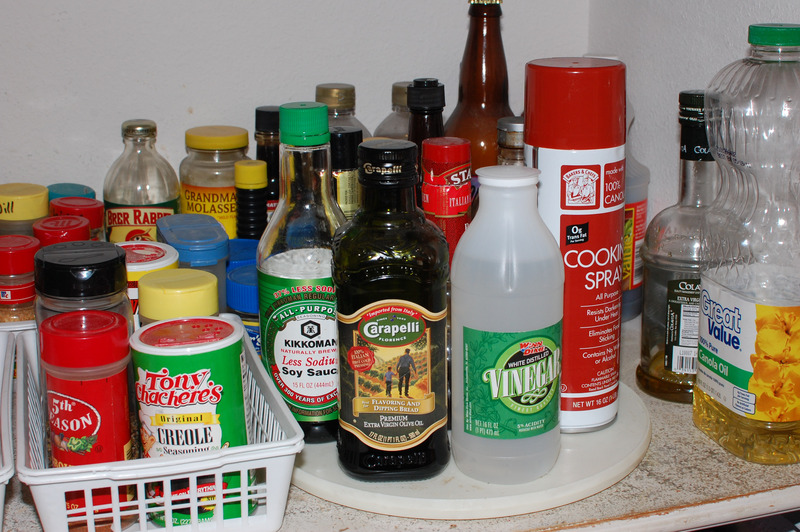 Soy sauce, Worcestershire sauce, cooking spray, a small bottle of white vinegar, and olive oil now stand on a lazy susan at the front of a shelf, while lime oil, Karo syrup, and Liquid Smoke occupy a back corner. Bulk-sized bottles are stored on the floor and are used to refill the smaller containers. Next I tackled the kitchen cabinets. Bulky Items that I use infrequently–roasters, the Bundt muffin tin, my beautiful but heavy enameled cast-iron Dutch ovens–got their own shelf in the garage. I kept a few toast pans and cookie sheets in the kitchen and sent the extras to the garage as well. 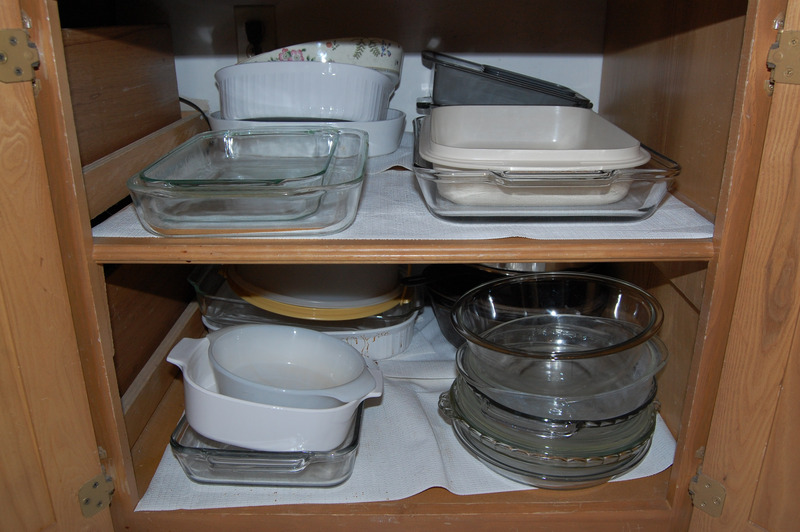 Casserole dishes used multiple times a week were moved to front of the cabinet and stacked no more than three pieces high. Retrieving the 13-by-9-inch dish now requires only a slight bend, rather than a deep squat and a minute of moving and restacking smaller dishes. And my silicone baking-sheet liners, which are indispensable but awkward to store, were rolled up and slipped into paper-towel tubes. I’m happy to report that the taskonomic kitchen organization system has been in place for two years. While occasionally straightening is needed, a pantry spruce-up no longer requires an afternoon. The cabinets won’t be featured in House Beautiful, but the things I use most often stay accessible, without much intervention from me. Next time, I’ll talk about my simplified bill-paying system. Until then, as you organize your pantry and cabinets, don’t just sort and stack. Design a sustainable system by viewing your workspaces throughout the lens of taskonomy. Kim Wolfinbarger is the recruitment coordinator and a PhD candidate in the School of Industrial Engineering at the University of Oklahoma. Her research interests include driver behavior, intelligent transportation systems, and design for aging. She is a member of the Human Factors and Ergonomics Society and the Institute of Industrial Engineers.